“…I believe people want to be part of something bigger than themselves. When you find people who will give up everything to pursue God, they show up on purpose, they cry out to God and become consumed by worship of Him… that should really be the heart of the church and that’s what this album is all about…” Recognised for his hit songs “Rushing Waters”, which was covered by Aaron Shust, and “You Are The Fire”, covered by Michael W Smith, worship leader Dustin Smith has returned with his sophomore label album, the live offering Coming Alive, released on Integrity Music. 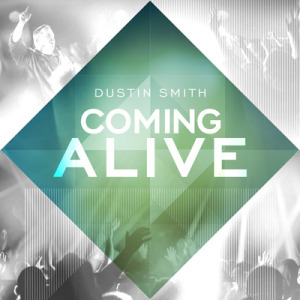 Though I haven’t really heard Dustin’s music before, he has a pretty cool testimony (that begs to be read here), as well as a fervent heart for Jesus, evident through his songwriting and his worship leading. I know what you’re thinking- this is yet another live album, which may be similar in style to other worship artists like Smitty, Kari Jobe and Desperation Band. You may be right in that respect, and to be fair, Dustin hasn’t reinvented the wheel in terms of worship music (and at times, some of the songs were slightly too long, and I found myself tuning out a little bit), however it is admirable that Dustin is just as on fire for God as he’s ever been. These 12 songs, no matter if they are 10 minutes or less than that, beautifully encapsulate and highlight his love for Jesus, and that fact alone should encourage us to hear what he has to say throughout the next hour or so. Though not my favourite album of 2014, Dustin has recorded a competent and solid album, worth many more listens in the future! What I love as a whole about Dustin’s album is that he’s never afraid to share his heart and be real with God. The lyrics may be simple on the whole, however Dustin cries out every word with such conviction and authority that it’s hard not to be engaged with the album overall. Though some people may be put off by the album length (every track is 5 minutes and over, with a few stretching over 7 minutes! ), others will love this. Yep, most of the tracks have repetitive choruses, spontaneous free worship segments, and parts where the crowd can interact, not to mention stirring and emotional instrumental solos and a grand intro and outro, similar to artists like Jesus Culture and Bethel in the structure. Though this description of the album may seem I’m knocking the album musically, I will firmly say that I am not. The music is simple and easy to follow for singing in church, yet it is the delivery of the lyrics that makes this album great! With plenty of co-writes on the album, Dustin and his friends have given us a vibrant collection of songs intended to praise Jesus’ name! “Coming Alive”, co-written with Stu G, is a mid tempo guitar led anthemic track, where Dustin powerfully exclaims that Jesus has changed our lives and we alive because of what He has done. The impacting chorus where Dustin relays that ‘…we’re coming alive, we’re coming alive now, Your voice is like thunder shaking our walls down…’ is most inspiring; and this attitude of giving God the glory is translated to the rest of the album! The rockfish worship anthem of “Now And Forever”, led by the electric guitar, outlines how God is faithful and can be trusted, as ‘…I will lift my eyes for I know who holds my life, both now and forevermore…’, with Dustin’s voice at his very best, and the captivating guitar hooks carrying the song musically; while the guitar led mid tempo anthem “Who Is Like Our God” sounds musically very similar to a Hillsong worship ballad, as Dustin places on his Kristian Stanfill hat vocally, and delivers one of the best songs on the album, with the theme of the track being praising our God because there is no one like Him! Tracks like the radio friendly guitar prominent “He’s Alive” (co-written by Michael W Smith, Michael Farren and Seth Mosley) and the poignant, captivating guitar ballad “Extravagant Love” (written with Leeland’s bother Jack Mooring) remind me of Dustin’s prowess as a writer and a worship leader, with both of the tracks being one of my favourites on the album! The songs outline and delve into God’s sovereignty and that Jesus has won the fight so that we can proclaim this to everyone we meet, and that He also lavishes love to us so that we can reap the benefits of the result of that fight- which is eternal life. The album then ventures into ballad territory (“He’s Alive” is the last full on upbeat song on the album), and that is where Dustin really shines as a vocalist. Standing tall at 8 minutes, “Breathe On Me” is the pinnacle of the album in my opinion, where the Holy Spirit is allowed to move and invade people’s lives, as we sing out Jesus’ praises and eloquently outline that He is allowed to fill our worship space with His presence so that He can reveal more of His presence to us. Musically simple, with the guitars and keys at the forefront, the lyrics are simple yet effective. As Dustin sings out ‘…Jesus come and breathe on me, breathe on me, I need You to breathe on me, breath of life, breath of life…’, there’s a sense of awe and peace that I know is Jesus, and that’s the best part of the song, when I know that lives can be changed by just basking and soaking in the presence of God. With the synth at the forefront, “Come Rushing In”, which was written with Richie Fike, and also featuring Katie Wormly on guest vocals, is an acoustic piece which doesn’t really build up musically, yet still is as powerful and explosive lyrically, as the song ardently relays to God that He can come into our hearts and move if He wants to, a gentle yet potent call for revival in this world. Co-written with Ed Cash, the piano and drum focused slower tempo worship ballad “We Want To Know You” is another simple track, yet there’s something about it that pulls me in to pay more attention to the track. It’s another presence driven song, as Dustin prays to God, asking Him to ‘…open the heavens wide, come let Your glory shine, our one desire is we want to know You…’, followed by an epic majestic crescendo that has me with goosebumps! “Surround Us Now” is a mid tempo guitar led radio friendly ballad, where Dustin eloquently cries out, and passionately asks God to ‘…let Your Glory God surround us, come and make this holy ground…’, and is where we can sing with unashamed and unbridled abandon the praises that aren’t enough for our sovereign and almighty God; and the explosive mid tempo guitar ballad “Eyes Like Fire” uses quite a lot of metaphors and imagery to try to accurate depict Jesus and His love for us. It’s clear that Dustin’s songwriting is much more cohesive and more adventurous in the last few tracks of the album, and I commend him in his delivery of the ballads especially, given that some of them are similar musically, and could have sounded the same to others, but thankfully are very distinct. “Home”, a drum and keys led slower track, speaks of the dichotomy and juxtaposition of God’s presence, as He is someone we can love and rely on, yet we should also fear and revere Him as well. Can we both fear and love at the same time? Should we? Is the fearing only reserved for early on in our Christian walk, then our feelings for God changes to love and adoration? These are the questions that Dustin attempts to answer, and concludes that whatever our feelings towards God, as Christians His is home ‘…where Heaven screams through our bones, home, this is home, like fire burning through our souls, oh this is home, Your presence is home, sweet home…’– an adequate assessment of longing to be in the presence of Christ, yet also being apprehensive about standing in the present of a Holy God. Another live version of “You Are The Fire”, also on his first album Rushing Waters, is next, and is just as poignant, impacting, encouraging and catchy as the versions before. However, for some reason, Michael W Smith’s rendition on Sovereign captivates me more. The final song, “(Be Exalted) In The Dust” is a hymn like melody, and Dustin sings on this track beautifully. With the theme of the track summing up the theme of the album, which is all about praising God in the good times and the times that we struggle; this song brings to the fore the concept in which we can understand and comprehend, that we ourselves come from dust, yet also were fashioned by God’s hands with a perfect plan for us. Once we wrestle with this notion, I believe we can truly worship God freely and with abandon, and I commend Dustin for showing us part of the way to live free and worship God for who He is! “…We’re not writing songs to make better church services. I couldn’t care less about that. We’re not interested in chasing radio. It’s the heart of God we’re chasing…” Though not as flashy and popular, and more raw than other CCM and worship artists in the industry, like Hillsong Worship, Bethel Music, Planetshakers, Meredith Andrews, Matt Maher and Leeland to name a few; Dustin Smith has shown us through this album that praising God can look messy. Praising God doesn’t equal high successful song played on radio. Possibly Dustin’s album may not have any radio airplay, or it possibly may not have more album sales than other bands, however as an album, I think his efforts need to be congratulated, as we all need this album as a reminder that true worship does have any rules, and true worship doesn’t look like any particular style. A brilliant songwriter with an overflowing heart for Jesus; Dustin’s album Coming Alive is a joy to listen to, even though the songs drag on for a bit! You would definitely be pleased and blessed by these songs, well done Dustine! Previous PostLara LandonNext PostTV Thursdays: When My Favourite TV Character Dies!